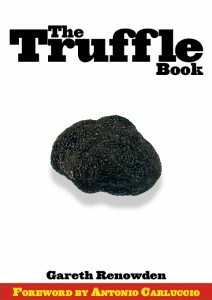 What did we do with the first truffle? We ate it, of course. Once you’ve dug up a truffle, they have about a week’s shelf-life, so… I stored it in a plastic container on a bed of risotto rice and some eggs. As noted earlier, a couple of those eggs became breakfast, and very nice and truffly they were too. A couple of days later, four more eggs and about a third of the truffle went into a brouillade which my daughter and I enjoyed for lunch. A great deal. Early the next week, after passing from had to hand at a Probus meeting where I’d given a talk, it went into my dinner thusly: I cut some flaps in the nice piece of fillet steak I had in the fridge, and inserted truffle shavings. I then trussed the steak with string and left it to truffle for a few hours. The remainder of the truffle (bar a few bits reserved for later) went into a very nice ripe bit of NZ brie. Later, I opened a bottle of good wine (Danny Schuster Omihi Reserve 2004), got some real chicken stock out of the freezer, and began making a red wine risotto with the rice the truffle had been sitting in (which, by now, was pretty smelly). When that was just about done, I added in the reserved bits of truffle, and slapped the steak onto the hot griddle. Served the steak on a bed of risotto. It was very good – but would have been even better if the truffle had been fully ripe — and if I’d left the steak longer to truffle. The risotto was perfectly delicious, but the act of cooking does drive off much of the the flavour it’s absorbed, hence the need to add a few bits at the end.